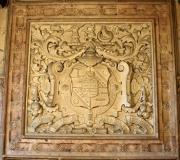 The Kay coat of arms is proudly displayed at the top of every page of this site; do we have any right to it? We like to think so! In heraldic terms, the arms are described as “argent two bendletts sable, and for crest a goldfinch proper”; the motto “Kynd Kynn Knawne Keppe” translates to “Keep kind to known kin”. The Kays of Woodsome (in Almondbury in Yorkshire) certainly have a right to them. Sir John Lister-Kaye, direct descendant of those first Woodsome Kays, tells us that the first grant was made by Richard II in 1378 to “John Kay of Woodsum“. 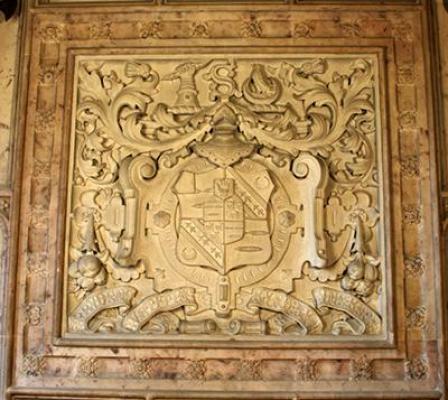 The family registered their right to these arms during one of the visitations in the 1530s, and in 1564 the grant of a crest, the goldfinch proper, was made to Arthur Kay of Woodsome. The photograph to the right is of those arms, still preserved at Woodsome; click on the image (or any image on this page) for a larger version. Woodsome is still standing, though it is now a golf club; in the hall of the house, there used to be two panels painted on both sides, one showing John Kay, the then head of the family, and his twelve children (“his fruit o Christ blest”). 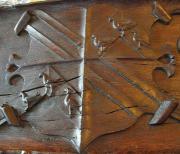 The Kay arms, quartered with those of Finchenden could be seen at the top; the other shows various families and their arms with which he claimed a relationship. Those panels can be seen on our Kay Homes page. The Woodsome Kays certainly had the right to those arms, but the Lancashire Kays seem to have felt the same right although no official registration was made. 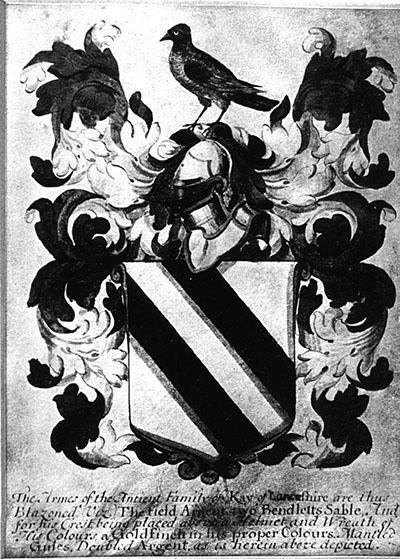 Writing in 1908, Kenneth Kay recorded having seen an old painting on parchment that had been in the possession of the Kays of Cobhouse in Bury depicting these arms with the description “The Armes of the Ancient Family of Kay of Lancashire are thus blazoned (viz) The field Argent two Bendletts Sable, And for his Crest being placed above a Helmet and Wreath of His Colours, a goldfinch in his proper colours, Mantled Gules, Doubled Argent, as is herein above depicted”. The picture reproduced here is one that he took at the time. He recorded that his great aunt Sarah Kay had seen the same arms painted on the wall of old Cobhouse farm (pulled down in the 19th century and replaced by the present building) with the date 1665. The lengendary Captain Kay, who was one of the Royalist commanders at the siege of Lathom House during the Civil War, came from Cobhouse, and they were a family of some status in the Bury area. Other Kays from the Bury area used them as well, particularly those from Bass Lane and Baldingstone – a number of seals and items of furniture in the possession of the latter family have survived which use the crest. The closest the Lancashire Kays have come to official recognition of the use of these arms was when James Phillips Kay, the 19th century public-health reformer and educationist and himself a descendant of the Bass Lane Kays, married Janet Shuttleworth of Gawthorpe Hall in 1842 and took his wife’s name. His son Ughtred James Kay-Shuttleworth was created the first baron in 1902, and it is from him that our president is descended. The arms of the family are those of Shuttleworth quartered with the same Kay arms, though with the addition of three crescents and three ermine spots. The goldfinch is still there, as is the motto. Three families preceded the Kayes at Woodsome—the Nottons in the thirteenth century, the Tyases in the fourteenth century, and for a short time afterwards the Finchendons, whose emblem—the finch—still adorns rain-water-heads, etc., as though to perpetuate the memory of Dame Alice Finchenden. 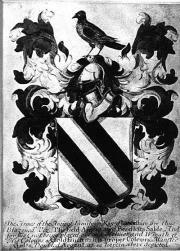 In 1378 she granted the manor of Woodsome to John Kaye for twenty years, but when John married Dame Alice’s daughter the emblematic bird was snared for posterity, so the speak, and Woodsome became a Kaye possession. The Kayes retained ownership until 1726, when Sir Arthur Kaye’s daughter married George Legge, Viscount Lewisham, eldest son of the Earl of Dartmouth. Even now that little finch persists—in the crest of the present Earl of Dartmouth, the club’s president. As can be seen, that emblematic little bird has also been snared as the crest of the Kay coat of arms. I am uncomfortable with your interpretation of the Kaye motto. I suppose that ultimately with puns riddle and alliterations of that antiquity, one can create one’s own interpretation – there are no hard and fast rules, but it may interest your readers to know that this motto first emerged in the 14th century and that it was going strong by the time the first recorded manor house was built at Woodsome Hall in 1486. I own two wooden Tudor plaques dated 1576 on which the motto appears as Kynd Kynn Known Keep (later it appears as Kynd Kinn Knawne Kepe). It is thought that this motto was part of the grant of arms by Richard II. I was brought up to believe that our motto had two meanings: Keep to your Known Kin and Kind – in other words the ultimate snob motto – or more acceptably and the one I prefer, Keep Known Kin Kind – or keep your known family kind, the medieval of kind being acceptable, agreeable, pleasantly disposed to others. 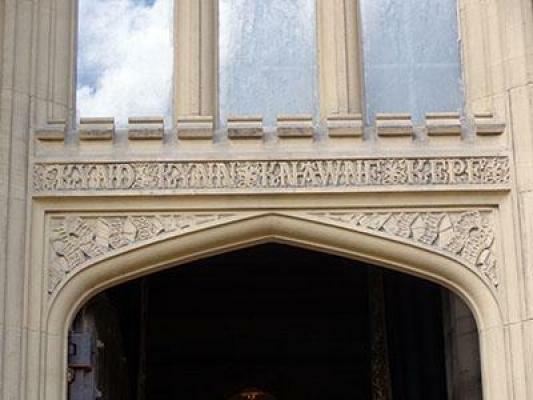 In 1980, I had the motto checked out by a leading medievalist at Oxford. His view was that since all medieval heralds were intellectuals who were probably also bored and underemployed, they resorted to wit and pun to keep themselves amused. It was also very fashionable to have a witty motto. He favoured the latter interpretation I have given above.